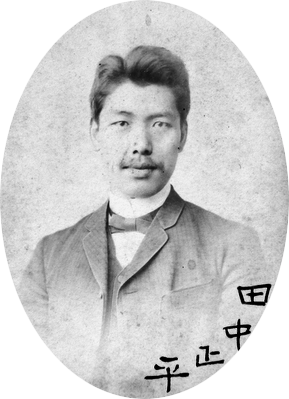 In early 1890s the Japanese scientist and inventor Shohé Tanaka (1862-1945) (see biography of Shohé Tanaka), at this time making his doctoral studies in Berlin, Germany, devised an adding machine. 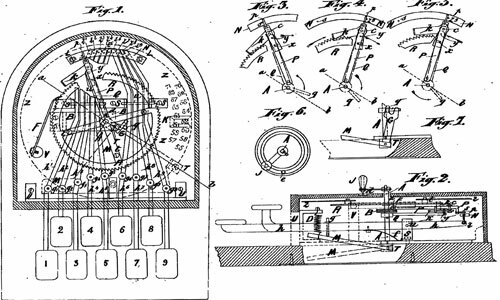 In 1895 he applied for and later obtained several patents for such machines: two German patents from 1895 and 1896 (DE90288 and DE92217), a French patent from 1897 (FR262466), and a Great Britain patent from 1898 (GB189708723). Actually the primary object of Tanaka's invention was a stop mechanism for adding machines, preventing the toothed wheels from surpassing. Let's examine the device of Shohé Tanaka, using his Great Britain patent (see the lower drawing of the patent GB189708723). The object of Tanaka's stop mechanism for adding machines is to prevent the toothed wheel, called number wheel in these machines, being worked by the spring or tappet which makes it move, from surpassing, by its acquired speed the exact point it should reach to mark a number required. In such machines the rotation of number wheel takes place generally at once by depressing a key, and therefore when the keys are played very rapidly or with great force, then the number wheel, on account of the force acquired, will move far beyond the expected amount. This inherent problem of keyboard calculators remained unsolved in the most machines of the time, thus was addressed by Tanaka's invention. The apparatus is characterized by a moveable rod and a stoppage-click, which is allowed to assume a rotation movement of a certain amplitude on this moveable rod. This stoppage-click is functioning in such manner that the pressure exercised upon a key of the adding apparatus, places the click into contact with the toothed-wheel or number wheel, causing it to turn until the moveable rod runs against a vertically moving peg fastened to the extremity of the lever of the key operated upon, so that any subsequent rotation which might be occasioned by the speed obtained by the toothed wheel during its movement is absolutely avoided. A spring having during this time sent up the key on which a pressure was exercised. The stoppage-click being thus loosened from the teeth of the number wheel returns along with the moveable rod to its former position.